May 4, 2017 11:09 A.M.
As part of the 2017 Budget, Ontario is improving access to high-quality care for people living with dementia and their care partners. Increasing access to adult day programs for people with dementia and additional hours of care and transportation to help people travel to their local program location. Enhancing caregiver respite services, both in-home or overnight, so that caregivers can schedule breaks for rest, family commitments or other priorities. Expanding behavioural supports, which are tools and techniques used to address behavioural symptoms of dementia, in all long-term care homes and providing similar support at home and in the community. Improving the coordination of care, including building strong partnerships between primary, specialist and community care providers that are critical to help people with dementia live well. Continuing to invest in health care providers' education with in-person, educational resources and public awareness about the signs and symptoms of dementia to support geriatric care. Raising awareness about dementia risk factors and reducing stigma through targeted public awareness campaigns to inform and educate people in Ontario about dementia and how to maintain a healthy brain. Through the new dementia strategy, the province will ensure that everyone living with dementia in Ontario, their families and their care partners have the right supports, funding and tools in place to make informed decisions about their care and that they continue to be treated with the dignity and respect that they deserve. Ontario is proposing to invest $100 million over three years towards the dementia strategy. There are approximately 175,000 people in Ontario living with dementia, with the number expected to grow as the population ages. It is estimated that 6.5 per cent are 66 years old and younger. These investments build on Ontario’s work to improve the lives of people living with dementia and their families, which includes annual funding for Behavioural Supports Ontario, supporting the Finding Your Way initiative that helps people living with dementia live more safely in their communities, and strengthening Alzheimer Society chapters across Ontario. The health care budget will total $53.8 billion in 2017-18 — a 3.8 per cent increase from the previous year. Ontario’s Dementia Strategy is part of Ontario's Patients First: Roadmap to Strengthen Home and Community Care, which is the government's plan to improve and expand home and community care over three years. Ontario’s Dementia Strategy was informed by public consultations with thousands of people in Ontario, including people living with dementia and their care partners, health care providers and organizations sharing their views through in-person and online consultations. Through the 2017 budget, Ontario is also making it easier for people who care for loved ones, with more respite services that allow people to take a break from their unpaid duties, increased education and training opportunities for caregivers, and a new, streamlined Ontario Caregiver Tax Credit. 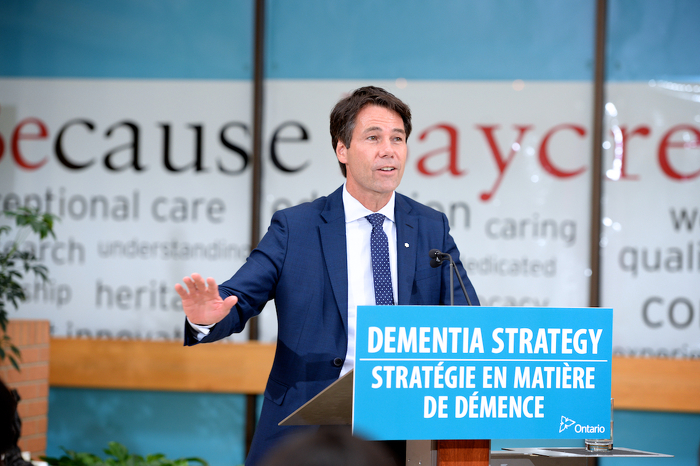 Minister Hoskins speaking at the event to announce Ontario’s Dementia Strategy at Baycrest Health Sciences. 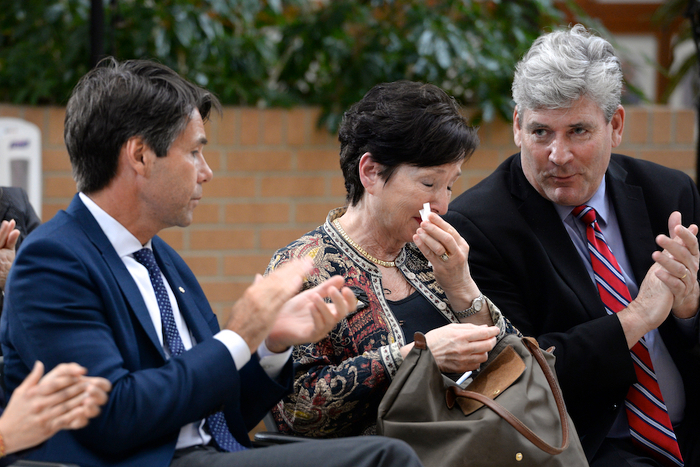 (Left to right) Minister Hoskins, Elaine Lambert, wife and primary caregiver of a Baycrest client, and PA John Fraser. Elaine spoke to the realities of caregiving, which is often provided by family.